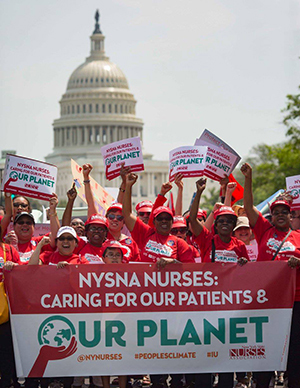 As environmentalists, labor unions, and local, state and world leaders come together to find solutions for a healthier, more sustainable environment, nurses are there. As frontline caregivers, we see first-hand the impacts of climate change, including increases in disease and catastrophic harm from extreme weather events, and we have an important role to play in reducing harm to our patients—and the planet. NYSNA nurses are engaged in local, statewide and national struggles for clean air, land and water—which are all essential to good health. We witness first-hand the health disparities that result in communities that are overburdened with pollution; from high rates of asthma and other respiratory diseases, to an increase in cancer, heart disease, kidney disease, and diabetes. Elevated levels of lead and dangerous chemicals in our water can be toxic and deadly, or can have long-term effects on individuals’ physical, intellectual and emotional health. We have supported the residents of Hoosick Falls, New York in their efforts to hold a giant chemical company accountable for the toxic pollution to their water. As part of the Transform Don’t Trash NYC campaign,we have highlighted the danger of toxic diesel fumes to our patients in the South Bronx. During our Convention in Albany, we protested dangerous “bomb trains” that carry highly explosive fracked oil throughout our state. And we attacked the problem at one of its sources, the oil fields of the Dakotas, when we demonstrated our solidarity with the First Nations’ Water Protectors at Standing Rock against a new major pipeline project. We work in coalition with Riverkeeper, to clean up the Hudson River and protect New York’s other essential waterways. The extraction and burning of fossil fuels is ruining the health of every living thing on the planet, driving cataclysmic climate change, and fueling an existential crisis that would not have been imaginable a generation ago. We must transition to a just, clean energy economy based on respect for people and the planet. Nurses bring our experience as patient advocates and union activists to broad coalition and international efforts to create a healthier future for all of us. Through NYSNA’s relationship with the international Trade Unions for Energy Democracy coalition, we have had a voice in major world climate summits from Paris to Morocco. TUED’s public policy papers, member education programs, and videos are instrumental in forging a broad based understanding of democratically-controlled, publicly-owned energy resources, governed not by what will produce profit but what will meet the needs of families and communities. President Judy Sheridan-Gonzalez, RN, traveled to Paris to participate in the COP21 international climate talks. Speaking on a panel on trade unions and climate change, she advocated a “just transition” framework, noting, “This is an urgent call for an immediate and significant transformation process that moves us away from dependency on carbon-emitting poisons, in a manner that embraces energy democracy. When communities have control over the production and distribution of clean energy, that’s environmental justice.” The agreement that came out of these talks was historic, laying the groundwork for further measures that increase accountability and move us toward the just and sustainable future nurses demand for our patients and communities. Not long after, NYSNA was invited to participate in the United Nations Framework Convention on Climate Change (UNFCCC) in Marrakech, Morocco. NYSNA works with a number of coalitions in New York, to help pass legislation and make changes through grassroots campaigns that improve the climate and health for all New Yorkers. Some of the coalitions we’re proud to be a part of include Climate Jobs NY, the Aliance for a Greater New York (ALIGN), and their Climate Works For All campaign, Labor Network for Sustainability, as well as the NY Renews Coalition.